Kaiser Permanente in Downey is expanding its hospital. Groundbreaking was last summer. You can see part of the beginning construction here. This week, they brought in this massive crane to lift the steel girders used in the construction. It took them three days to put it together and make it operational. A few years ago, my friends teased me when they caught me relaxing on the couch, eating ice cream and watching an exercise video. (Seriously, I was checking it out for future use!) I was reminded of that moment when I saw these three friends socializing on the leg press machine in the Kiwanis Fitnes Area at Furman Park. Frankly, I'm tired of the rain. And the cold. I'm really really looking forward to spring! But, one redeeming aspect of the rain and cold has been snow in our local mountains. The snow views have peaked out at me and surprised me when I least expect them. Also, when I don't have a camera, or when I'm driving and can't take a picture. And when I intentionally venture out to get a picture, the clouds are back and the snow is hiding. 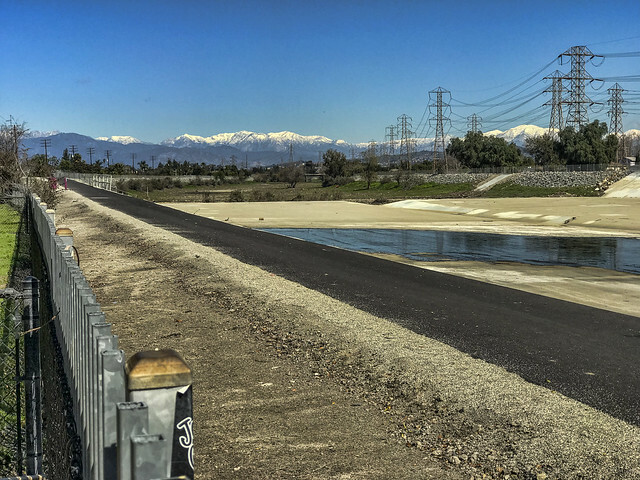 Finally, the snow and the opportunity came together a few weeks ago at the dog park at Rio San Gabriel Park. From here, you can see how low the snow is. At the far right, you can see Mt. Baldy (officially Mount San Antonio). At just over 10,000 feet, it is the highest peak in the San Gabriel Mountains, as well as the highest point in Los Angeles County. 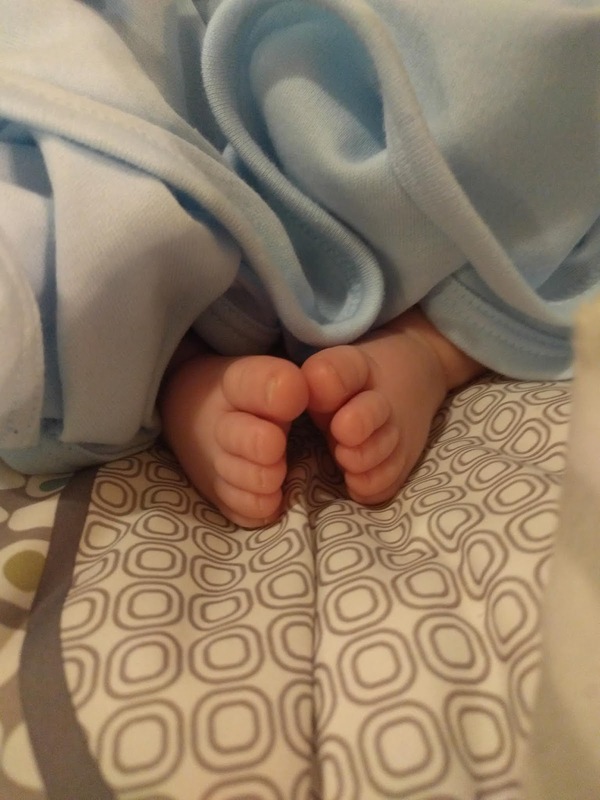 We are visiting our son, daughter-in-law, and new grandson in Florida. Now that our children are having children, we are being asked about things that happened when our children were younger. First words, first steps, school work, and so on. My problem is that the older I get, the more my memory is becoming a blur. I have a few memory snapshots of my children growing up that I can still call up. But even though I lived everyday with them, there are years of living I can't remember. But what I do have are lots of pictures of my children. Each one of those pictures brings back memories of the events that surrounded our taking the picture. I can remember Christmases, school plays, birthdays, and just being family. These days I love pulling out a pile of pictures and going through them to bring up those memories. 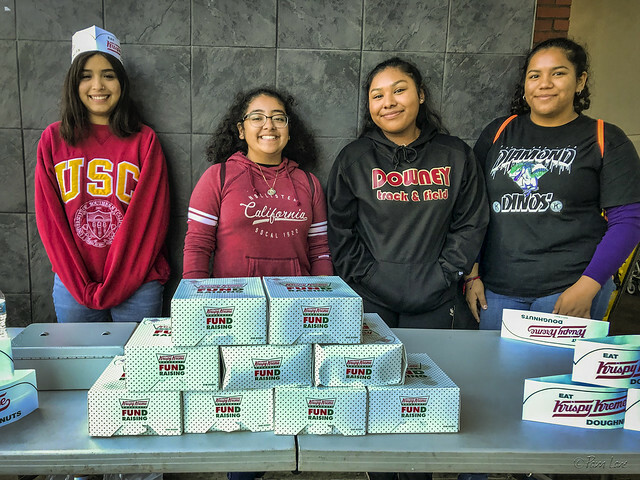 For nine years, Downey Daily Photos has been publishing photos and stories of our Downey community. 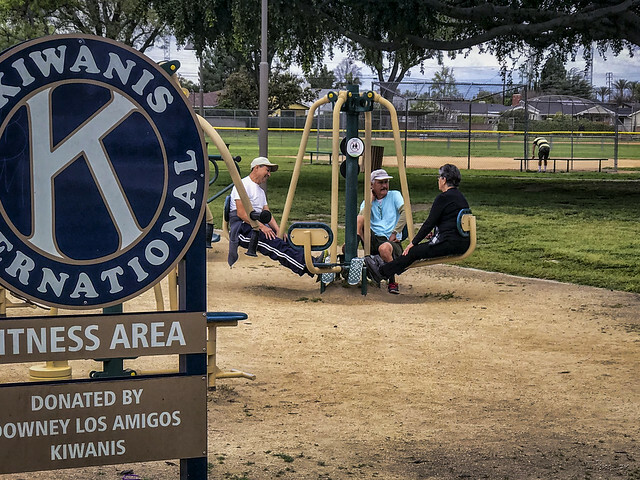 These photos and stories are meant to bring to your attention events and people that, put together, make up a small part of the life of Downey. 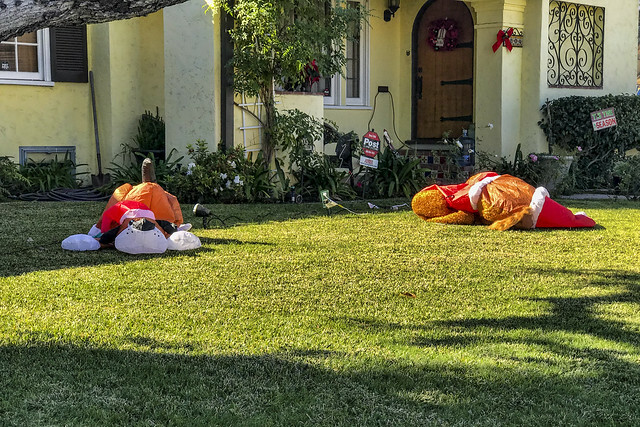 The holidays are over, and it isn't just the holiday decorations that are feeling a little deflated. The busy-ness and excitement of the holidays are over, and most of us are back to school or work. If you google "post-holiday blues", you'll find lots of articles explaining the causes and suggesting remedies. The two remedies I like best come from 6 Ways to Beat the Post-Holiday Blues. First, simply take the time to remember and reflect upon what you loved best about the holidays. And second, schedule in time with your friends. And if possible, combine the two by meeting friends at Porto's for an early breakfast and lots of fun memories. 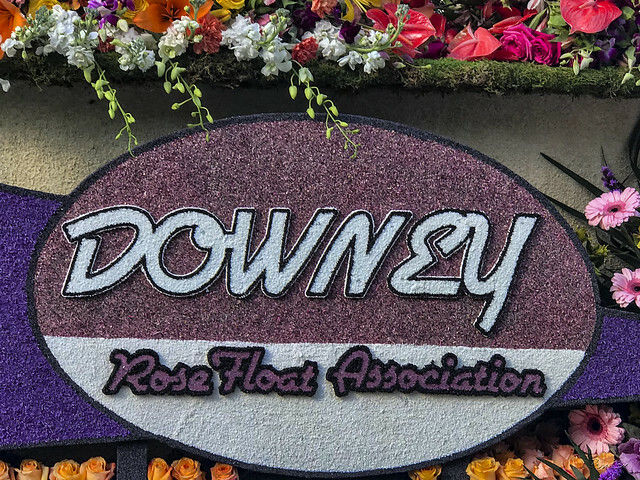 On Monday morning, I went by to see Downey's entry in the 2019 Rose Parade. The workers were putting the finishing touches on this year's float. 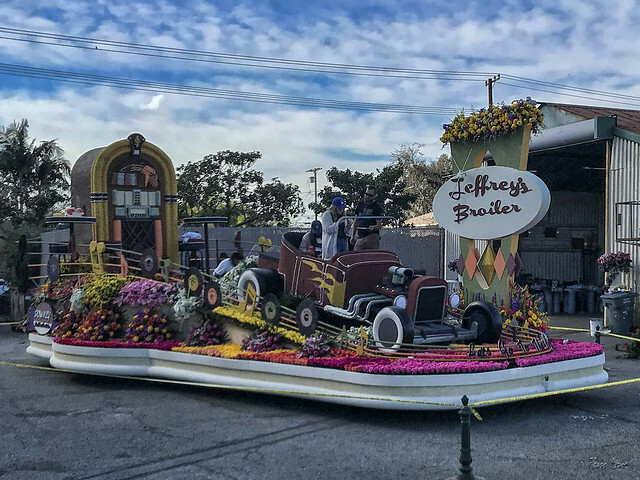 According to the Patriot, "In coordination with the 2019 parade’s theme 'Melody of Life,' Downey’s 2019 entry into the Rose parade is called 'Let’s Go to the Hop' and will take viewers on a rip-roaring, swinging and jiving nostalgic cruise back through the 1950’s...Downey’s entry remains one of only six floats that are designed, built, and decorated solely by volunteers." 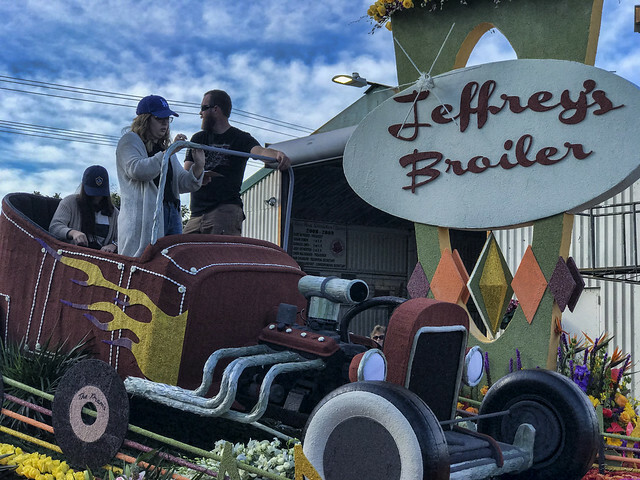 Downey is one of only eight cities that enter floats in the parade. That's pretty remarkable when you consider how many cities there are in the Los Angeles area. At first, I thought there was some sort of protest. 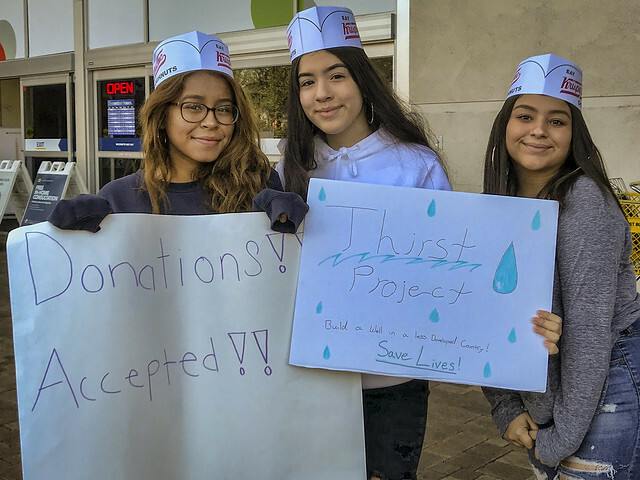 But when I got closer, I discovered girls from the Downey High School KIWIN'S club, cheerfully raising money for the Thirst Project. For a dollar a Krispy Kreme donut, I can help them raise money to provide a community with safe drinking water. The Thirst Project mission is to build a socially-conscious generation of young people who will end the global water crisis. These girls are off to a good start!